Our annual day of the riff celebration is fast approaching. 15 bands across two venues (imagine a baby Devonshire Desertfest), minimal clashes with a full possible 10 backtoback hours of RIFF. We are busy writing album 3.....but we love touring. 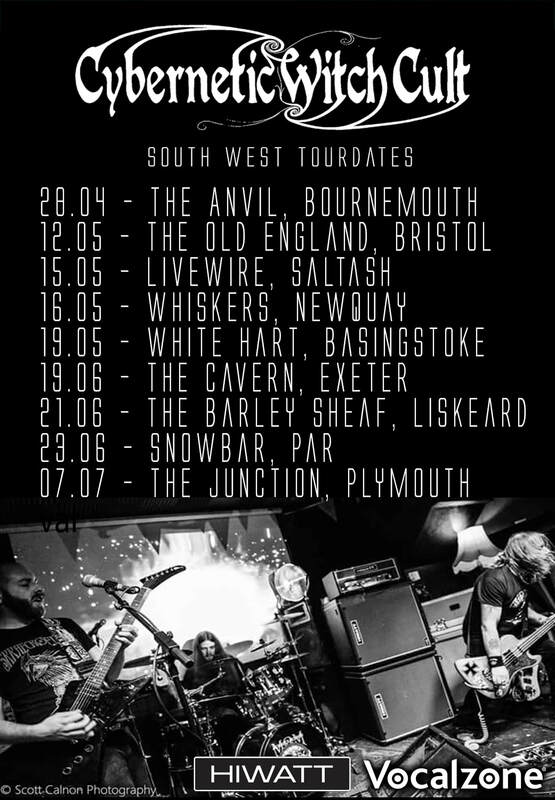 We decided to make our summer dates closer to home, with this spread out south west tour!! See you on the road with new material being road tested at each show! 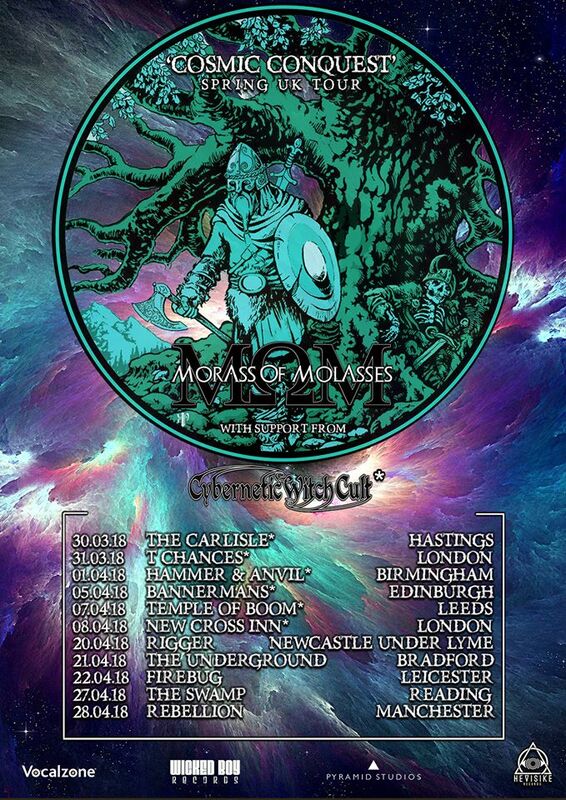 UK Tour with Morass of Molasses this April! Less than two weeks till our UK tour with Morass Of Molasses! 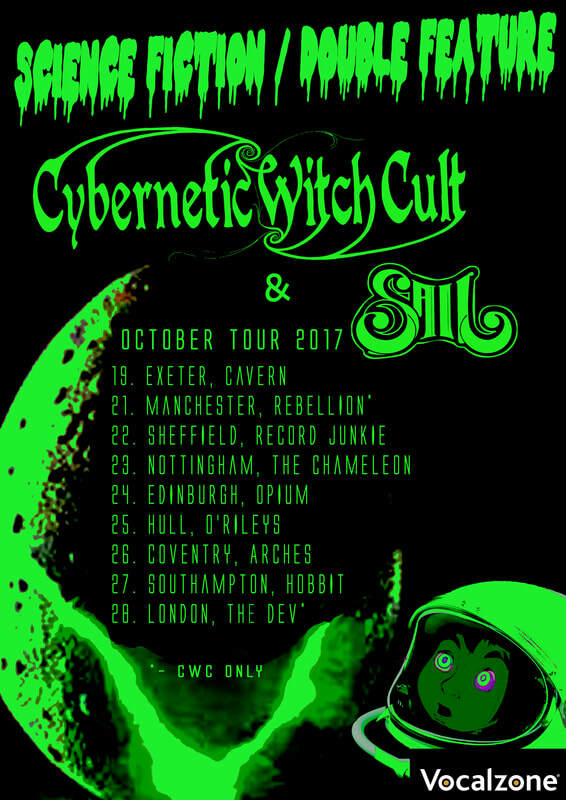 This October we make our way across the UK with our south west sludge brothers Sail. This is our first tour with our new bass player Doug MacKinnon! Playing in some new cities and some of our favourite venues cant wait to meet friends new and old. Head over to the Gigs page for more details and ticket links!! Listen on iTunes, Spotify, Amazon etc. ​Four dates coming up to support the release of Troglodithic Trip! 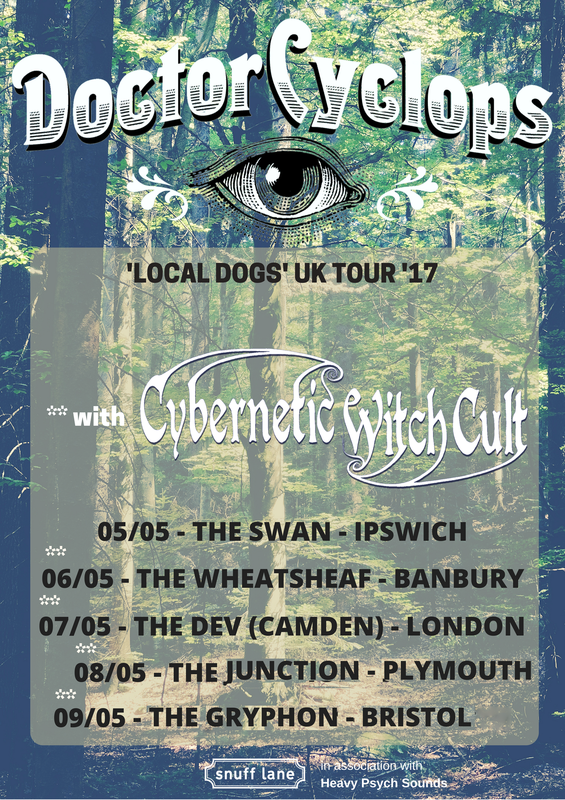 Supporting Doctor Cyclops on their UK Tour. TROGLODITHIC TRIP - EP COMING SOON! 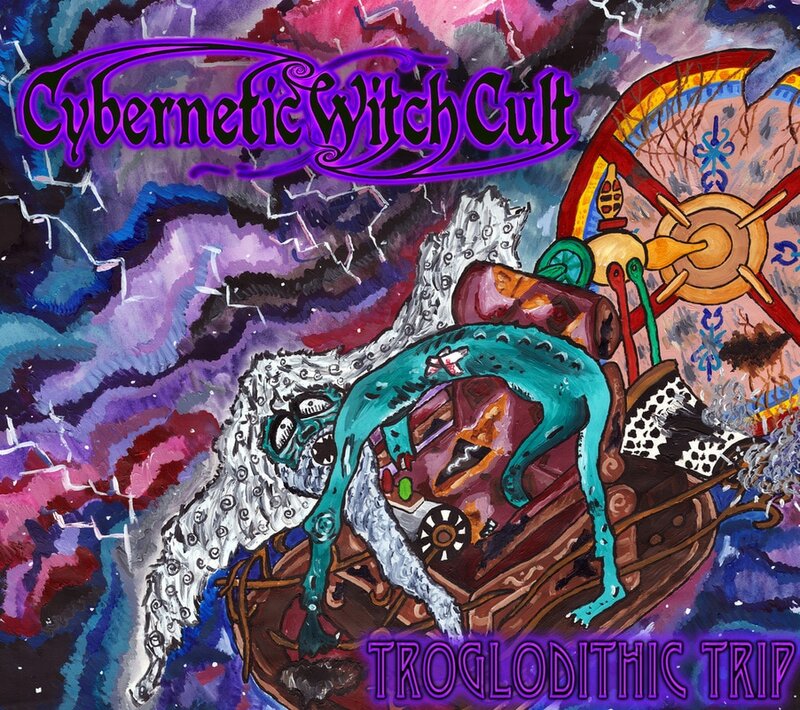 Happy to announce recording is complete for the new 6 track EP "Troglodithic Trip". Featuring 2 brand new tracks and 4 re-recorded (re-imagined) tracks from our first release "Morlock Rock". The artwork is again by Aimée Wyld who has reimagined the first releases art, and the album was recorded at Freefall Recording studios which is where we recorded Spaceous Cretaceous! Music videos, studio diary and release date coming shortly!! So to end a very successful year for us we're releasing our first live album, recorded at the Unicorn, Camden in December 2016. Its a digital only bootleg, you can find it on our bandcamp or on all usual digital outlets (iTunes, Spotify etc). Thanks for a great year, we've got a release coming in the Spring with a mix of new and old tracks, look out for more news coming shortly! 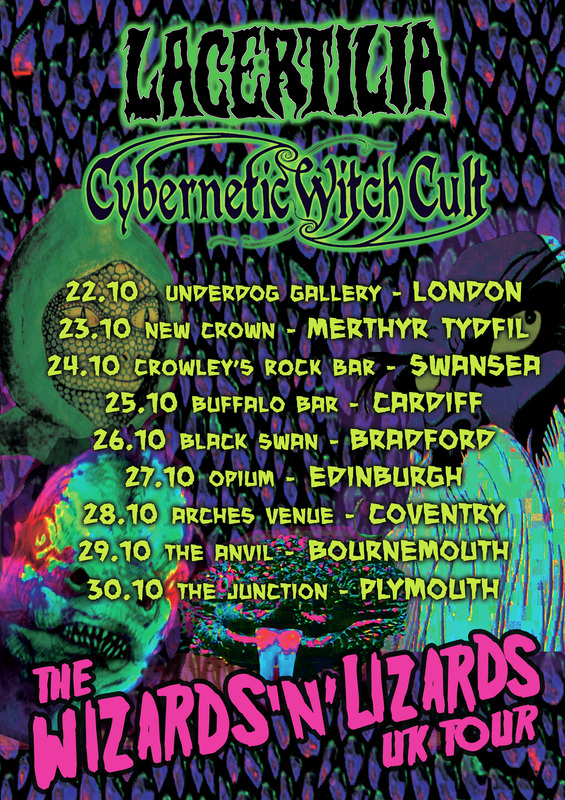 In October we embark on our first UK tour with Welsh stoner psych lizards Lacertilia. We cant wait, new material old material, video show, 9 dates around the UK. First time in London, Scotland, Bradford, Coventry and Swansea! Crazy UK inventor and youtuber Colin Furze has been kind enough to use one of our tracks from 2015's now sold out 'Morlock Rock'; TYRANNOSAURUS HEX, hear the track as he builds perhaps the best shed in existence (covering his apocalyptic bunker - filled with science fiction weapons). Over a million people have now been forced to listen to us! RESULT! Check the video for our set at Bloodstock 2016. Massive thanks to everyone who came and packed out the Jager tent, we were blown away by the response!! New Merch! Shirts, Hoodies, Patches, Stickers! Our first zip hoodie (very limited edition), New 2 colour patch and we've got some nice new stickers to get plastered all over the world! Order early to ensure you get the right size. We are ordering about 50 shirts, and 20 hoodies, all sizes are available as preorder but we shall be ordering limited stock. so preorder if you want a specific size!! Well it is unleashed upon the world! Spaceous Cretaceous, 9 tracks of spacey psychedelic, proggy, stoner doom. We have been humbled by the response so far and have sold over two thirds of our first edition, with some amazing feedback. Available on Spotify, iTunes, Amazon, and most digital outlets. The launch party was amazing, great crowd and atmosphere and our favourite gig so far this year. 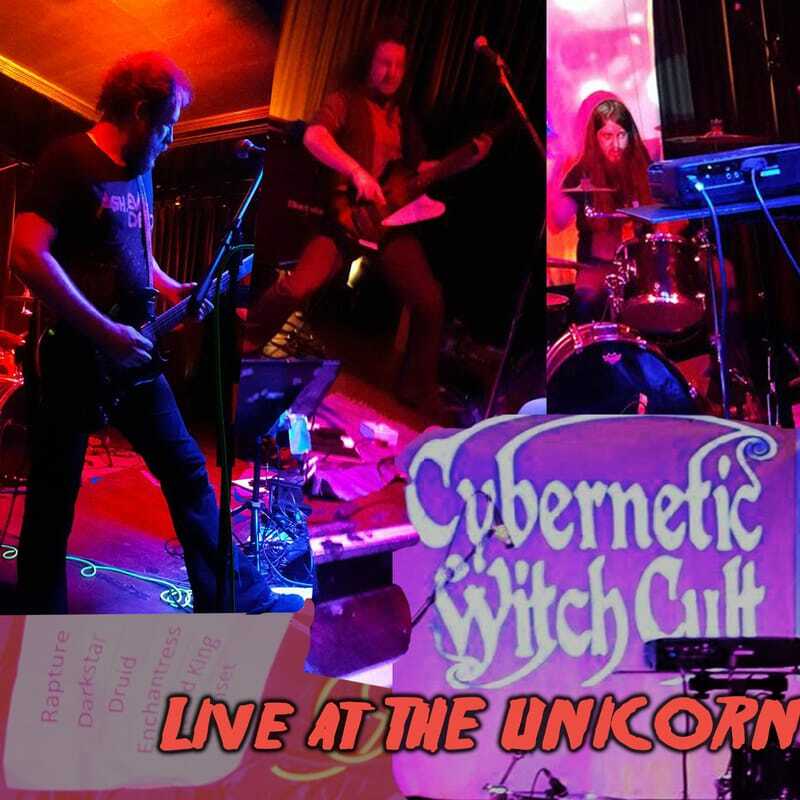 To commemorate it all, we've put together a video using footage from the launch party for the big epic of the album: "High Wizard (King of the Horsehead Nebula)". Massive thanks to everyone involved in this release; fans, radio stations, reviewers, and Adam Chinner, Aimee Wyld, Dan James, Matt Grimwood to name a few. Second release from Spaceous Cretaceous! A tribute to the 1974 John Carpenter cult classic DARK STAR! First release from Spaceous Cretaceous! Here we go, a 3 minute promo for the album, featuring a snippet from each track! Less than 4 weeks until release now (28th May) get in your preorders using the link below!! Discs will be ordered by the end of this week to arrive on release day! ﻿﻿The follow up to 2015's 'Morlock Rock' is nearly here! "Spaceous Cretacous" will be our lastest offering, 9 tracks merging doom, psychedelic, stoner and 70s heavy metal into a science fiction horror masterpiece! We're looking ahead and will try to print this album on vinyl later in the year, but for now its going to be a CD digi-pack only, we've found a company that will print onto 'vinyl style' CD's with grooves and everything and we're going to be offering a choice of black, green, purple or orange vinyl style CDs to all preorders, these will be extremely limited edition so get in an order if you really want a specific colour! Check our youtube for studio updates, the album will be released on the 28th May 2016, with a launch party in Plymouth. Check gigs page for details. So 2016 is well away, we've written a 9 track second album which will be titled "Spaceous Cretaceous" and released at the end of May. Its heavier, doomier, more psychedelic, weirder and we cant wait to start gigging the new tracks. Loads of gigs booked for the first half of the year, get onto the gigs page to check them out. Also happy to welcome new drummer Rogan Collins to the band who is bringing a 4th dimension to the music. Merchandise is running low, as are copies of our debut album 'Morlock Rock' and we're not sure how long a wait it will be for the next pressing. Anyway should have some album art and a track list for the new album next month, see you at the next show. That was a crazy year for us, thanks to everyone involved. 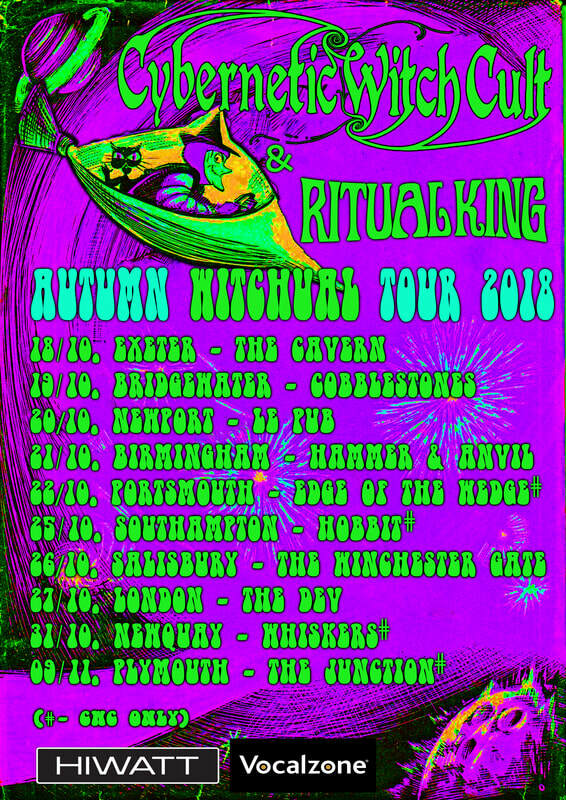 Starting off by supporting Morass of Molasses in Bournemouth (first gig for new drummer Liam), we then recorded and released an album, played with Diesel King, Wight, Tribulation, Skraeckoedlan, Grifter, WarCrab, Greenhorn, Monolithian, and many many more! Classic Rock magazine featured us on their Pink Floyd space rock issue, reviews from terrorizer, northern darkness and numerous radio spots. Overwhelming response to the first album, selling out the first batch of CDs within 3 months of release. We've had a great year, due to a great number of people we've been lucky enough to share a stage with/play for and we want to play twice as many shows next year. New album being written as we speak, we have a new drummer replacing Liam, new gear, and some new ideas for merch. Things have been a tad crazy lately! Morlock Rock is released worldwide, find it on iTunes, Spotify, Amazon or order a digipack direct from us! We are featuring on the September issues of both Terrorizer & Classic Rock magazines & on their included CDs (out now)! Lots of tasty gigs in the pipeline, and new reviews for you to read on the press page! Astrogalactic Sprites Lyric Video, taken from the forthcoming MORLOCK ROCK. This high budget video was recorded on the A35 between Cornwall and Bournemouth, and at 'The Anvil' in Bournemouth. Tracklist and album art revealed! PREVIEW TRACKS ARE UP!! ONLY A MONTH LEFT UNTIL RELEASE DAY! Cannot wait for this to be unleashed. Preorders available at £5 for a Digipack! Labels, Reviewers, Radio, Magazines and Promoters get in touch and we can send out a promo copy ahead of the July 17th Release date. Preview tracks on the media page. 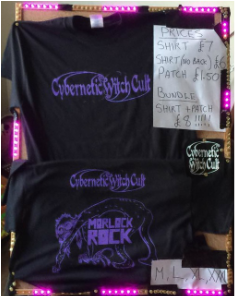 T-shirts and patches are available from our web store! You can either select postage or collection at our next gig. Loads of sizes and options! All proceeds go directly back into merch fund to increase variety and decrease cost (to you) for future merchandise! - Join the cult!! Check the store page for more details. Through the semi final, and into the final! 17th May, Exeter Cavern. If we win this, we're at Bloodstock!!! Come down and support us!! 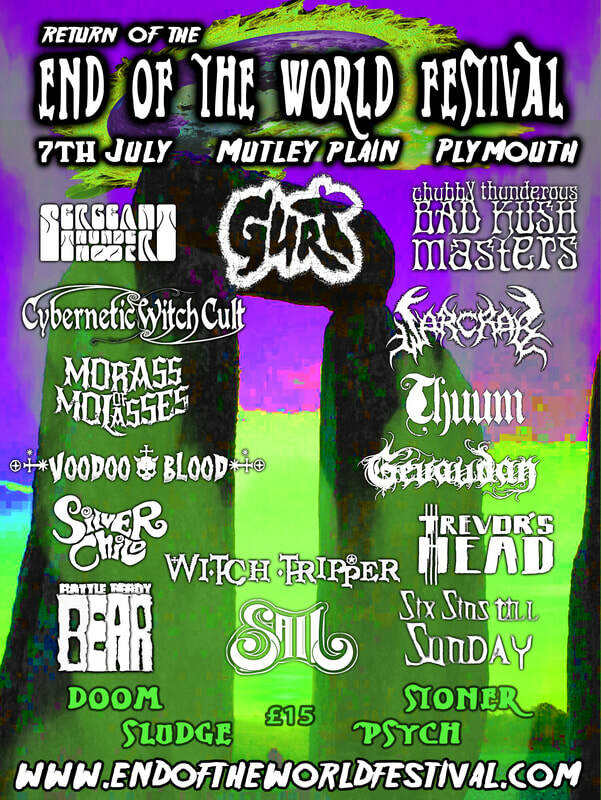 Some great bands on the bill, cant wait for this one! Guitars, Bass and Drums have been recorded for the upcoming album 'Morlock Rock'. The album will be released towards the end of June and the pre-order is available now. Morlock Rock will feature: Cybernetic Witch, Tyrannosaurus Hex, Children of the Corn, Astrogalactic Sprites, Forbidden Fruit, Deadly Mantis, Fifth Column, and Human. Check the media page for studio photos.